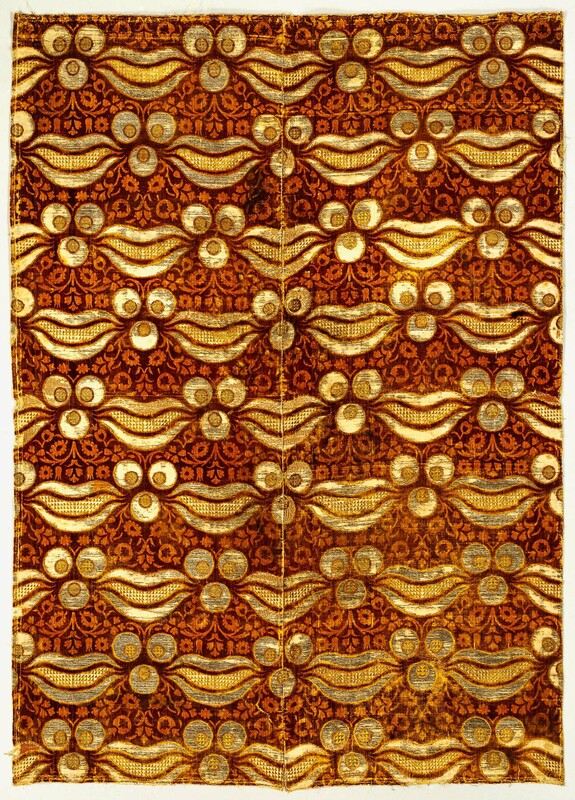 Textile, 1500–1600. Turkey, Ottoman period (approx. 1299–1923). Cut and voided velvet with supplementary weft patterning; silk and metal-wrapped thread. Courtesy of Rina & Norman Indictor. Image © Rina & Norman Indictor, photo by Sheldan Collins. SAN FRANCISCO, Feb. 23, 2015—More than just practical clothing and furnishings, silk velvets symbolized sophisticated taste and cultural power in courtly Islamic society, especially during the 16th–18th centuries. Woven Luxuries: Indian, Persian, and Turkish Velvets from the Indictor Collection offers a glimpse of the splendor and diversity of these velvets. On view from March 13 through Nov. 1 in Tateuchi Gallery, this intimate exhibition focuses on a specific type of luxury silk textile. 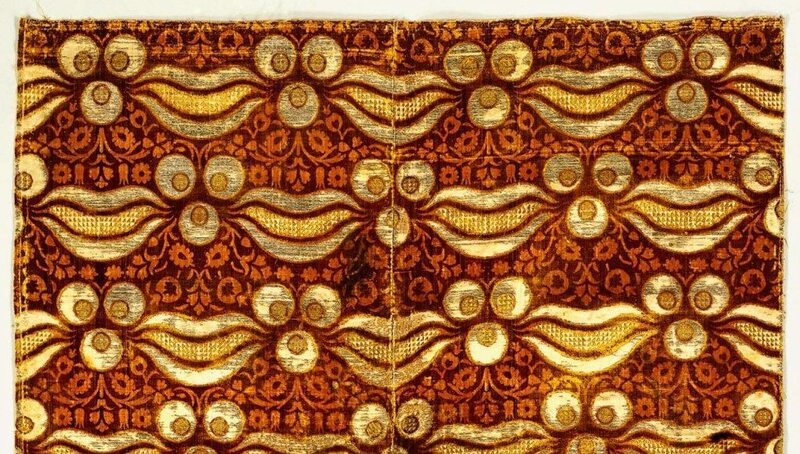 Delicate and sensuous, requiring high-quality materials and specialized expertise, velvets were made in more limited quantities than other types of fine textiles. Velvets were widely admired and traded in elite circles. Gaining popularity across the world from the 15th century onwards, velvets were the textiles par excellence at the royal courts of Mughal India, Safavid Iran and Ottoman Turkey—the three “superpowers” of the early modern Islamic world. These textiles were popular not only in their local contexts but also in Europe, where they impacted design and fashion. While used for ceremonial attire and robes of honor in diplomatic gift exchange, the principal use of velvet fabric was for furnishings such as carpets, throne covers, cushions, wall hangings and tent panels. Exhibition highlights include two complete 17th-century velvets from India and Iran, each measuring nearly 6 by 4 feet and preserving not only their design elements but also their vibrant colors. The exhibition also features a fragmentary Mughal carpet border, whose high quality of artistry and materials suggests that it would have been made for a royal patron. On public display for the first time is a large Ottoman textile featuring a motif associated with good luck. The ten velvets in this exhibition (six Mughal, three Safavid, and one Ottoman) offer a window into the world of elite Islamic culture during the 16th–18th centuries. Inherently vulnerable to deterioration like most luxury textiles, well-preserved velvets like these are scarce. Drawn from the private collection of Rina and Norman Indictor in New York, the textiles in this exhibition retain much of their visual impact and remain exceptional examples of design elegance. The Asian Art Museum is grateful to the Indictor family for generously loaning the velvets. Organized by the Asian Art Museum, Woven Luxuries is curated by Dr. Qamar Adamjee, associate curator of South Asian and Islamic art. The Asian Art Museum–Chong-Moon Lee Center for Asian Art and Culture is one of San Francisco’s premier arts institutions and home to a world-renowned collection of more than 18,000 Asian art treasures spanning 6,000 years of history. Through rich art experiences, centered on historic and contemporary artworks, the Asian Art Museum unlocks the past for visitors, bringing it to life while serving as a catalyst for new art, new creativity and new thinking. General Admission: FREE for museum members, $15 for adults, $10 for seniors (65+), college students with ID, and youths (13–17). FREE for children under 12 and SFUSD students with ID. General admission on Thursdays after 5 PM is $5 for all visitors (except those under 12, SFUSD students, and museum members, who are always admitted FREE). General admission is FREE to all on Target First Free Sundays (the first Sunday of every month). A surcharge may apply for admission to special exhibitions.